(CNN) -- Seventy-five Australian soldiers killed in the World War I battle of Fromelles have been identified, the first of about 250 whose remains were discovered at the site in France more than a year ago. The 75 soldiers were identified by name, Australian defense officials said Wednesday. A further 128 bodies were identified as being Australian. "The number of soldiers that we have been able to identify exceeds even our most optimistic forecasts," said Greg Combet, Australia's minister for defense personnel, materiel and science. About 2,300 British and Australian troops were killed in the battle and thousands more were wounded, captured or left missing in action when they were ordered to charge into German machine guns July 19, 1916, in northern France. So many died that night that British and Australians could not recover all their dead. German soldiers buried hundreds of them in mass graves, which were rediscovered in 2008. The battle of Fromelles remains the most fatal 24-hour period in Australian military history, Australian defense officials have said. Combet said officials are unlikely to identify every soldier at Fromelles, though they will try. DNA was key to identifying the soldiers, but historical, anthropological, and artifact evidence was also used, he said. "I am also pleased to say that we have strong reason to believe that more identification could occur in the future," he said. Excavations of the mass grave began in May 2009 and lasted until September. The Commonwealth War Graves Commission, which builds and maintains cemeteries for Commonwealth troops who died in the two world wars, built a cemetery near the site of the battle where the excavated troops are being reburied. The Pheasant Wood cemetery was the first full cemetery it had constructed in more than 50 years, the commission said. "All but one of the soldiers have been reburied in individual graves in the purpose-built Fromelles (Pheasant Wood) Military Cemetery," said Alan Griffin, Australia's minister for veterans affairs. Those whose identities cannot be determined will be marked by a headstone reading "Known unto God," the commission said. The final soldier will be buried at a special ceremony in July to mark the 94th anniversary of the battle, he said. "The new cemetery is a fitting resting place for these brave men, who made the ultimate sacrifice," he added. 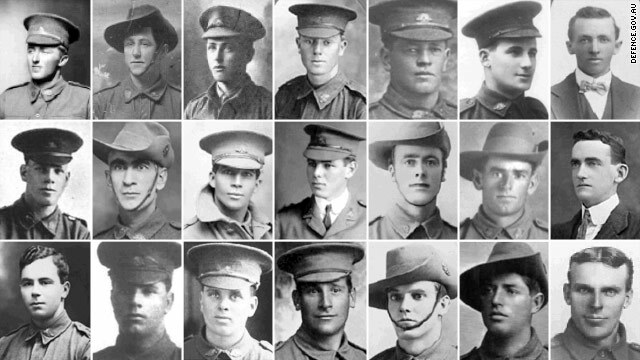 The Australian Department of Defence released photographs of some of the 75 men whose remains were identified. They include Cpl. Herbert Thomas Bolt of Sydney, Australia, of the 55th Battalion, who peers out from the picture wearing a slouch hat, a wide-brimmed hat pinned up on one side that is a trademark of the Australian Army. Private Henry Alfred Cressy, from New South Wales, of the 54th Battalion, sits for a portrait while wearing his military uniform. Private Clifford Dawson Holliday, also from New South Wales and the 54th Battalion, smiles in his picture while wearing a peaked cap. The men's ages were not immediately known. About 800 people from Britain and Australia who think they may have a relative buried at Fromelles have donated DNA to try to identify the bodies, said Peter Jones, the DNA consultant on the project. But that's only half as many as the experts need, he said, since about 1,600 Commonwealth dead from the battle remain unaccounted for. The Ministry of Defence urged people who believe they have a relative at Fromelles to get in touch. The 250 bodies being buried at Pheasant Wood are among the 1,600. Personal items found with the bodies have also helped experts identify them. In addition to military decorations, uniforms, and buttons, the items include personal effects such as a locket with a lock of hair, and a return ticket to Perth, Australia -- left on the body of a soldier who never lived to use it. A full list of the soldiers identified and also their photos is available on the Australian Department of Defence Web site. CNN's Richard Greene contributed to this report.